Best screenplay of the year! I do agree with this one. City of God would be a close call, though. A decision that made me happy. Well, any decision in this cattegory would have made me happy. I was really going for American Splendor, but this will do. Lost In Translation was my favorite film of the year, but I don't imagine it was all that much on the page (I think Coppola has admitted as much). I would have given it to something else. I would have given it to something else. But that's why the movie that turned out was so brilliant--because of how loose the screenplay is. I'll say that I'd probably never want to read the screenplay itself, but just because it wasn't a tight script that the the actors HAD to follow doesn't make it at all inferior to say American Splendor's script. 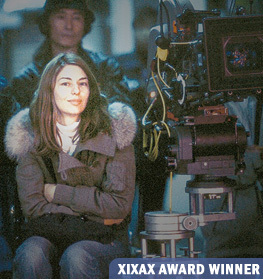 Sofia made it a combination of things: the script, the actors, and her spontaneity as a director. I applaud her for this, because I think the movie turned out better than it would have had it been a strict script to follow. Therefore I gave her Best Screenplay, anyways. oh, so u like lost in translation?